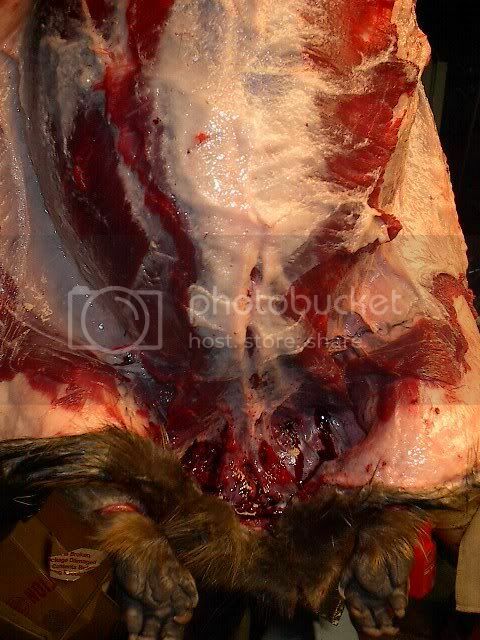 As you progress in skinning you go around the hind Quarters to expose the leg & down the back at this point I pull the rest down to the head neck area . 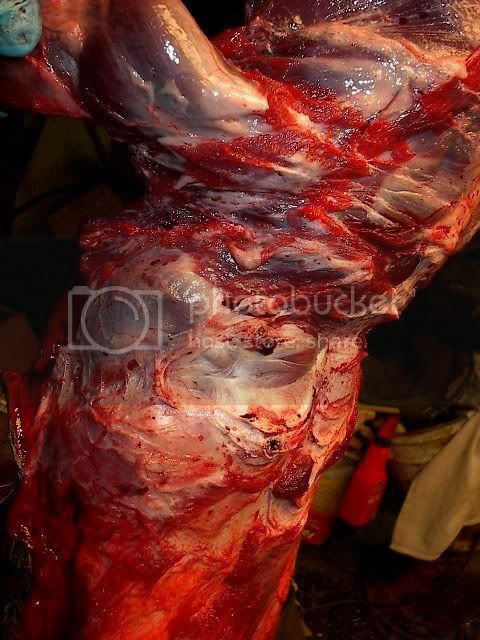 This picture shows the buttom side up by the head chest Area I find this is the hardest area to skin so be careful . 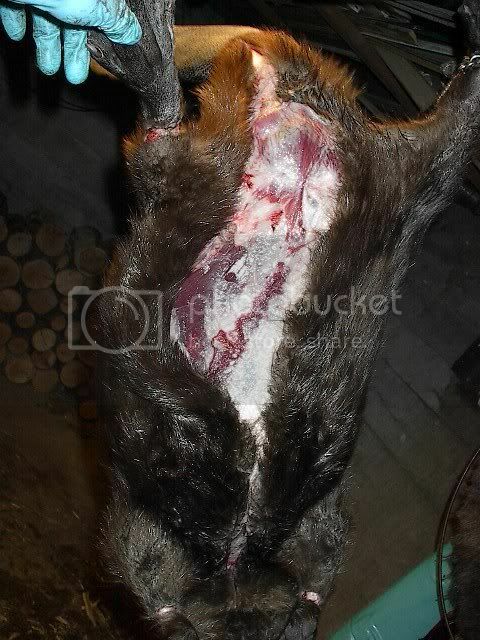 I like to leave meat where these areas are so Im sure not to cut the pelt easy to take the meat off while fleshing . This is a closer look as I say don't be afraid to leave some meat better then junking out the fur do to a hole from slipping with the knife . Ok this Area you like to Follow the nose Bone as tight as you can take your time and trim it slow untell you get the feel of the structure of the mouth and Nose area . 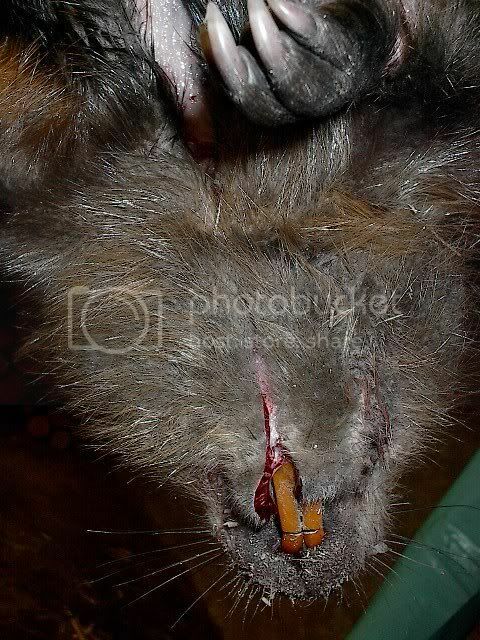 as you get close to cutting the nose off get as much cartilage as you can more so for taxi work then selling the pelt. Follow as I show here and the knife will roll around nice do to mostly bone and cut along the lip and jaw line as showen . 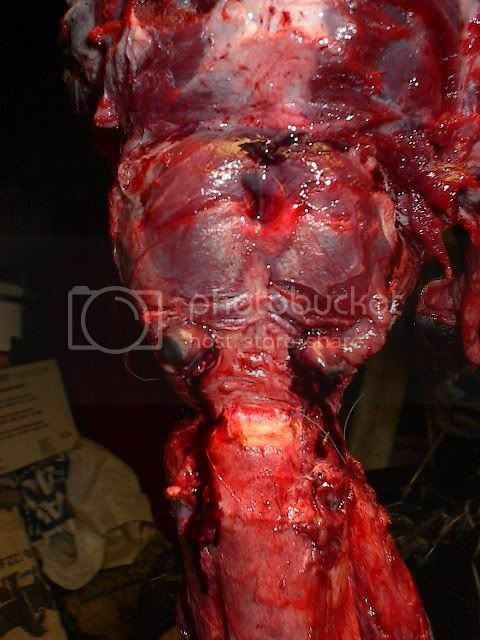 This picture shows the pelt head area after detacthing from rest of carcas . 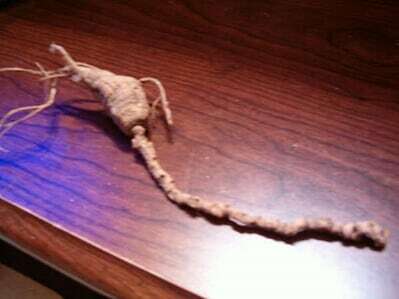 This is the castor sacks and oil sack . 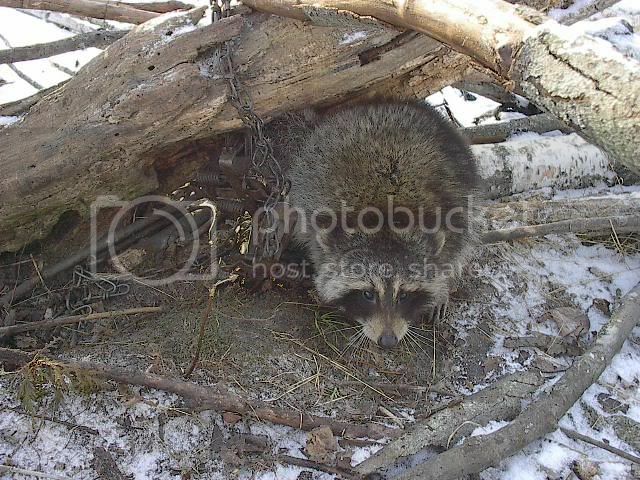 I like to use as much as possable on any animal I trap . so I make jerky, sausage out of the meat of the Beaver so only thing left is innerds and bones& feet . The heads I clean my self . I can knock'em out pretty quick on the bench top, but skin my fair share case style! Also like the way you can work'em on the beam when cased. Last edited by tmrschessie; 11/05/12 11:39 AM. Good information,especially like the pix. good job. well put together. Great instructions. Should be archived. Do you split them after you flesh them then? Im gonna try that method next season. Hope it gets in archives. Yes. Just finish the cut after fleshing. I should make it clear. When I say cased, I DO NOT mean cased in the traditional manner. Not the ol' heel to heel cut. The way to start a beaver to be case skinned is pretty simple. 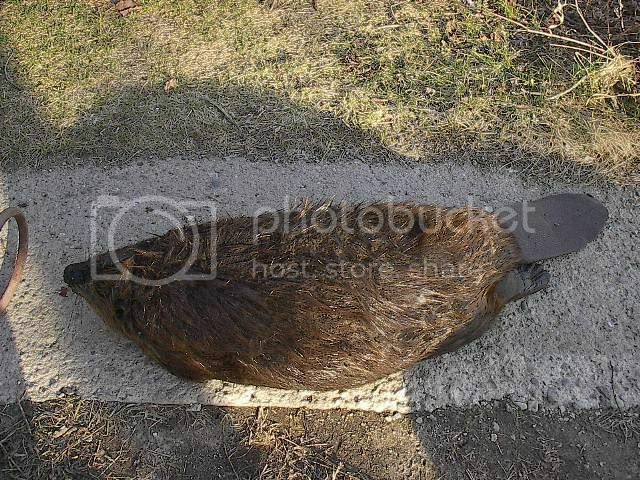 Place the beaver flat on his back. Start your cut at the base of the tail up through the vent continuing another couple inches. Make cuts around the two hind feet, then wring them off. Cut around the hairline circling the tail. Making sure not to cut too deep and weaken the connection of body to tail. Now start opening your cuts until you can pop out the hind legs. 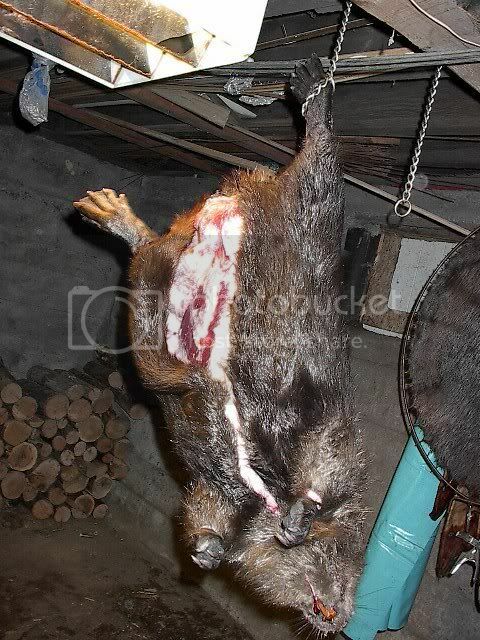 Then I use a rope with a loop put around the tail to hang the beaver from a rafter. Once hung I remove the front feet and make a couple cuts around the gum line inside the mouth. Continue pulling and cutting as needed. When you reach the front legs , pop them out and continue on down to the ears, eyes and nose. You're done. Sending this to the top for DannelBoone. He did a good job putting this together. It's sure to help some folks. Good stuff for us beginners. How about continuing with the stretching, fleshing, and drying pictures? I skin mine just like that...They stay on the fleshing board better for me partially cased. Last edited by Redknot; 04/16/07 04:53 PM. So you pull the pelt over the feet? Man, I have enough problems in that area and I cut the feet off. Hey Whisker, I was thinking the same thing. Thought maybe it was just me. I'm sure he does it the way that works best for him. Personally I aint got that much patience!!! LOL Guess I'm too set in my ways when it comes to certain things. I think post like this gets folks thinking. Whether new to beaverin' or crusty ol farts like me. Then they'll go about doing it that specific way or use it as a stepping stone to their own way! i have a question, how do you do the lips? do i do it just like anything else and get real close to the jaw with it and keep the lips on? Best way to skin a beaber is to give them away. 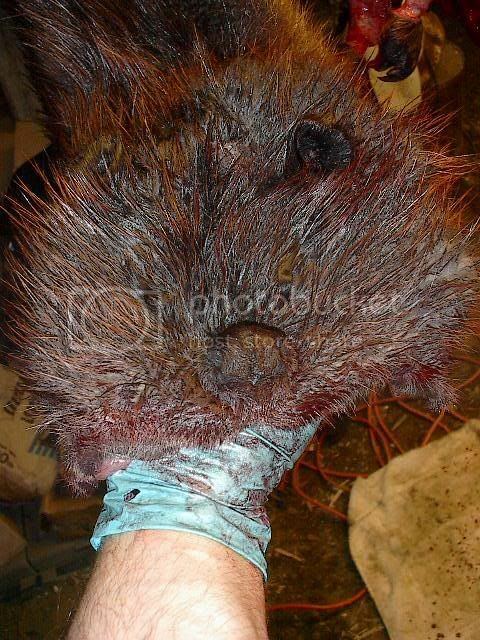 But I only trap Beavers as a favor to my landowners that have other fur that I really want. Boy I'm going to get it aint I.
Yep! You can later trim the lips and nose when stretching. Well beaver is one of the easy money animals for me and I was tought the skinning Technqite on the bench or table but didn't care for it so I looked for an easyer way and thats what I came up with works for me . anyways i do the same as you trap anything for anyone . I have never seen them case skinned like that. How long on the average does it take you? Is it any more diffuclt with the big ones? How does it help on the fleshing beam? Are you using a typical narrow beam or a big round one?